The beach surrounding this lagoon of floating houses was completely covered with dead fish. Most of them are supposedly gizzard shad, I understand from reading a recent news item. However, I saw several other varieties and sizes; there was even a big muskie among the carcasses. It’s a natural phenomenon. In winter sometimes oxygen levels under the ice get low and fish die. When the ice melts, the carcasses all wash up at once. It is apparently a rather large kill this year. I do not want to be on this beach on the next warm day! The owners of those floating cabins are going to need to keep the windows closed. 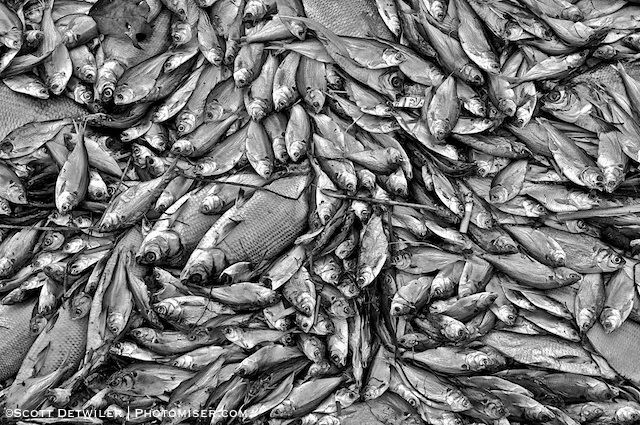 Not everyone will be put off by the fish kill. These gulls will benefit. I found these gulls at Gull Point in the park. Duh. Leaving Presque Isle, I traveled west a ways along Lake Road (PA-5). 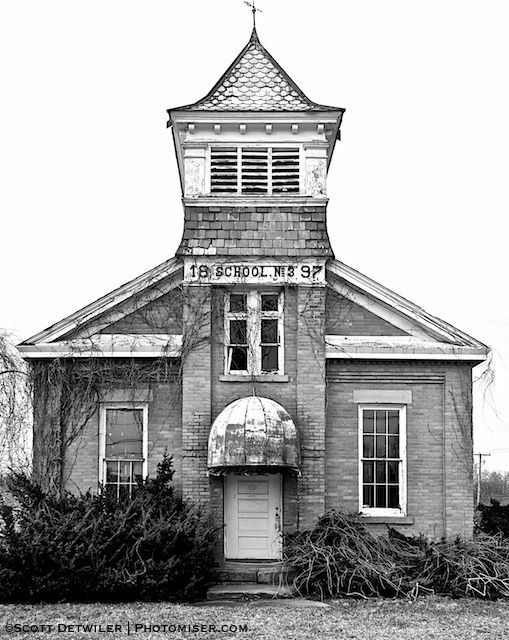 I came across this empty one-room school house. The brickwork was in excellent shape, but the building was beginning to deteriorate in other respects. Note the incongruous awning over the front door. Not too long ago a floral business (lettered “Floral Expressions” on the awning, difficult to read in this photograph) was using the building, which may explain why it was as maintained as it was. Judging from the condition of the awning I’m going to guess it’s been ten years or so since the building has seen even that use. The camera today was a Nikon D90. The gull image was taken with a Nikon 70-300mm AF-S ED VR; the others taken with the 18-55mm AF-S VR. Post-processing was done in Aperture with the Mono X preset by SEIM, plus a few of my own tweaks. The school house was further processed in PTLens to reduce the vertical perspective distortion. Long weekend in Erie, Pa. 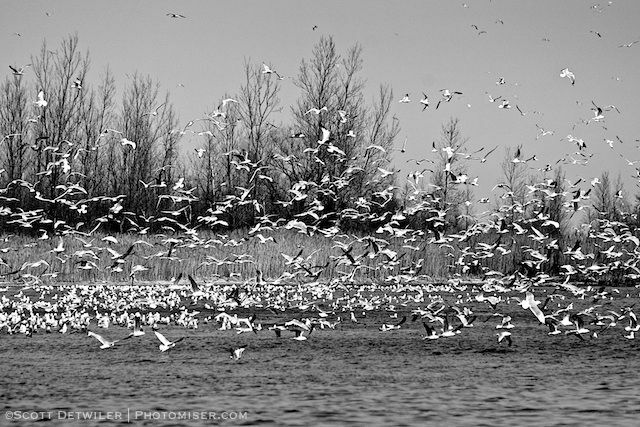 This entry was posted in Black and White, One Picture a Day, Photomiser Gallery and tagged Lake Erie.